SCUW is a novel, superconducting undulator with a wiggler mode that is to be tested and integrated in the ANKA storage ring. 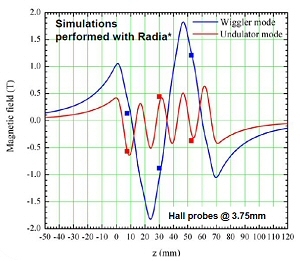 By aptly switching the coils, the coil arrangements can be run in undulator and wiggler mode; the resulting period length during the wiggler mode is three times the period length in the undulator mode. The SCUW is a magnet system cooled by means of four crycoolers, which makes the use of liquid gases such as helium and nitrogen unnecessary. The cooling system is sized to a 4 W.n. beam heat load.